AMAZING LAUNCH – VIP OPEN HOUSE NOW – BEST PRICES on The Drive with 82 Exclusive Bohème Vancouver Condos priced from just $229,900! 50 Affordable Homes under $349,900! THE NEW YEAR STARTS OFF WITH EXCITING NEWS FROM BOHEME VANCOUVER! Construction is starting on the grocery store next door! AND, we are pleased to present to you our pre-opening offer of owning at the pre-construction Vancouver Boheme Condos EVEN IF YOU DON’T HAVE A DOWN PAYMENT YET! * This is a rare opportunity to own a luxury home just minutes from downtown! Can’t decide? With our prices and quality you can even rent out, cover your mortgage and move in when you are ready! Boheme Vancouver condos for sale is a sophisticated new neighbourhood of white brick residences, shops and restaurants in Vancouver’s much sought after Commercial Drive area. These modern Vancouver Boheme condo residences combine generous private outdoor spaces and stylish interiors to create a truly unique lifestyle. Five minutes from downtown yet a world away! Homes starting from just $229,900! Commercial Drive Vancouver Bohème Condos for Sale! Millennium Developments is launching a new Commercial Drive Vancouver East real estate project called Bohème this Fall 2012! The Commercial and Hastings neighbourhood is a dynamic and eclectic community that is full of things to do and see, and here at the new Bohème Vancouver Condos on The Drive, Millennium Developments brings affordability and location to home buyers and investors. The tag line is: A Bohemian Rhapsody of Elegant Living- Coming Soon To Commercial & Hastings, which is very fitting for the Commercial Drive Vancouver Bohème Condos for sale which will feature elegant white brick and glass buildings set in a historic and ever changing neighbourhood. The architect for the new Bohème Vancouver East condos for sale is award winning firm Gomberoff Bell Lyon. The pre-construction Vancouver Bohème Condos will feature only 82 exclusive condo residences that will offer lots of outdoor space, great views and luxury interior finishes in an incomparable Vancouver East real estate location across from the Waldorf Hotel. Within walking distance to The Drive, the Hastings and Commercial Vancouver Bohème Condos in the East Vancouver real estate district will provide an ideal locale that is very close to the Adanac Bike Route and urban parks, restaurants and shopping, a grocery store that is proposed for the site next door to the Bohème Vancouver condos as well as The Drive neighbourhood that is well known for its eateries, bistros, entertainment, boutique and eclectic stores. Pricing for the East Vancouver Bohème Condos will start affordably from just $229,900 and there will be 50 homes priced under $349,900, making this an amazing opportunity for first time buyers and investors. For more information, please visit www.bohemeliving.com. We are pleased to offer you a rare opportunity to own a luxury home at Vancouver BOHEME Condos just minutes from downtown! EVEN IF YOU DON’T HAVE A DOWN PAYMENT YET! * A sophisticated new neighbourhood of white brick BOHEME Vancouver residences, shops and restaurants in Vancouver’s much sought after Commercial Drive neighbourhood. The presale Vancouver Boheme’s modern residences combine generous private outdoor spaces and stylish interiors to create a truly unique lifestyle. Five minutes from downtown yet a world away! 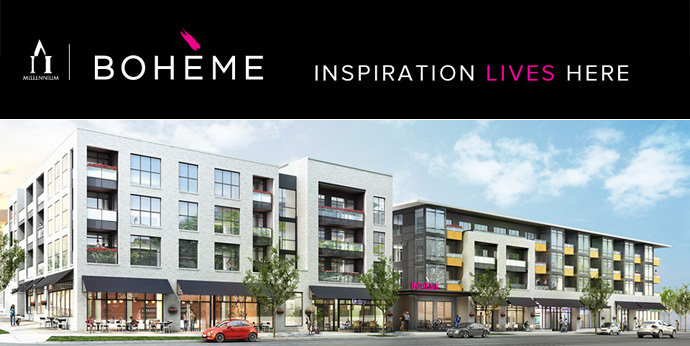 Boheme Vancouver Condo Homes starting from just $229,900! STRAIGHT OFF THE PRESS > Insider Info and Facts about the Bohème Vancouver Condos! Want new details about the exciting and very promising Bohème Vancouver condo project by Millennium Development? Want some insider info before the grand opening launch? Check these out … you will be impressed! > Limited storage lockers, so make sure you buy your presale Vancouver Bohème condo home early! > High-end kitchens with German appliances including built-in fridge! > 1 Bedroom Bohème Vancouver condos start from just $229,900! > Affordable Vancouver Bohème condos are truly awesome with 50% of all suites priced under $325,000! > Under market pricing with average $520 per square foot pricing … some less! This is an incredible opportunity to own in the Vancouver real estate market! Bohème by Millennium Development is the BEST offering this Fall 2012. A timeless architectural façade and interior detailing, the East Vancouver Bohème Condos for sale will be coming soon to the Fall 2012 Vancouver real estate market. The developer is Millennium Developments, well known for their luxury multi family housing projects throughout the Lower Mainland. According to their email blast > Bohème Condos in Vancouver East real estate district is located in the dynamic Commercial and Hastings neighbourhood. The pre-construction Vancouver Bohème condos will feature white brick and glass buildings designed by award-winning architects Gomberoff Bell Lyon. Featuring only 82 exclusive homes offering views, luxurious interiors, spacious balconies and terraces, all in an incomparable Vancouver location across the street from the iconic Waldorf Hotel and walking distance to the bohemian chic Commercial Drive area, numerous parks and amenities, Bohème Condos in Vancouver East real estate district is the only choice for today’s homebuyers. Close to Downtown yet a world away! All of this and INCREDIBLE PRICING. With Bohème Vancouver homes starting from just $229,000 and over 50 pre-construction Vancouver condos priced under $349,900 – owning at Bohème Vancouver is the ONLY CHOICE. Register today online for priority access. Don’t miss out on this incredible opportunity! The new Vancouver Bohème Condos is A Bohemian Rhapsody of Style, Elegance and Place. Welcome to Bohème Vancouver, a wonderful new neighborhood of white brick residences, shops and restaurants in the heart of authentic Vancouver. The East Van Bohème condo’s contemporary residences feature generous private outdoor spaces and stylish interiors to create a truly unique lifestyle. Brought to you by the Millennium Group, Bohème will continue the legacy of Millennium’s unsurpassed reputation of timeless quality and design, in the best locations. Five minutes from downtown yet a world away! With new Vancouver Bohème Condos starting from just $239,000. VANCOUVER’S BOHEME CONDO EXCLUSIVE VIP OPEN HOUSE IN OCTOBER! HOMES STARTING FROM ONLY $229,900!!! SATURDAY OCTOBER 27TH NOON TO 5 PM. From the BOHEME Vancouver condo email desk > As a Millennium VIP, we are pleased to let you be the FIRST to view and purchase the newest timeless offering from Millennium Development coming this Fall –BOHEME Vancouver condos. Located in the dynamic Commercial and Hastings neighbourhood, Boheme Vancouver Commercial Drive condos for sale will feature white brick and glass buildings designed by award-winning architects GBL Architects. The preconstruction Vancouver Boheme condos on The Drive will feature only 82 homes offering views, luxurious interiors, spacious balconies and terraces, all in an incomparable Vancouver location across the street from the iconic Waldorf Hotel and walking distance to bohemian chic Commercial Drive Vancouver real estate district. The preconstruction Vancouver Boheme condos for sale will put home owners and residents right in the centre of major transit routes just seconds away from your front door. Downtown Vancouver is accessible just five minutes away while the Canada Line is just six minutes away. The Commercial Drive Vancouver condo project will also be within direct buses of Simon Fraser University (Burnaby campus) and the University of British Columbia. Also nearby is Gastown within five minutes, Commercial Drive amenities and services within a five minute walk and the Waterfront Station just six minutes away that connects you to everything that the North Shore has to offer via the Seabus. Live close to Downtown Vancouver, yet a world away! The Drive Vancouver Boheme Condos by Millennium Development provide a central location that is close to shopping and the wonderful and exciting neighbourhood of Commercial Drive (The Drive as we call it), a proposed renowned high-end grocer next door as well as unique stores. Also close by The Boheme Vancouver condos for sale are authentic restaurants, cafes, world class cuisine, tranquil green spaces, urban parks and scenic walking and biking routes. All of this can by yours at INCREDIBLE PRICING. With new Vancouver Boheme condo homes starting from just $229,900 and over 66 East Vancouver homes priced under $349,900 – owning at Boheme by Millennium Development is the ONLY CHOICE. Your exclusive first chance to view and purchase at Boheme at the exclusive VIP Open House is coming soon to 1588 East Hastings Street Vancouver (just a block west of Commercial Drive). Don’t miss out on this incredible opportunity!